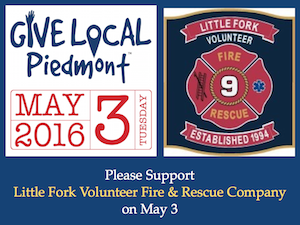 The 3rd Annual Give Local Piedmont (GLP) campaign starts at 12:01 a.m. Tuesday, May 3. The non-profit organization that receives the most donations during each of these four power hours will be awarded an extra $1,000 in prize money. The donation button should appear on this page starting at 12:01 a.m. tonight. Last year, Little Fork Fire & Rescue Company’s dedicated volunteers saved several lives, saved more than $3.2 million in property, and helped lower homeowner fire insurance rates by more than $1.7 million. We rely heavily on donations, grants, and sponsorships to fund our operations. These gifts allow us to continue to provide essential training, equipment and supplies for our dedicated volunteer firefighters and emergency rescue personnel. Our immediate goal is to raise the funds needed to build a new fire station with adequate heating, cooling and ventilation and suitable housing, sleeping and kitchen facilities for our hard-working volunteers. We are there for you when you need us; today we are asking you to be there for us by showing your support during this one-day giving campaign. Hosted on Tuesday, May 3rd by the Northern Piedmont Community Foundation, Give Local Piedmont is the community’s one-day, online giving event to inspire people to give generously to the nonprofit organizations that are making our region stronger, creating a thriving community for all. It’s our day to come together as one! Every dollar donated from midnight to midnight on May 3rd will be increased with additional “bonus” dollars generously provided by the PATH Foundation and prize dollars from sponsors. Last year, the Give Local Piedmont Campaign raised $727,000 from 5,000+ donations around the nation!